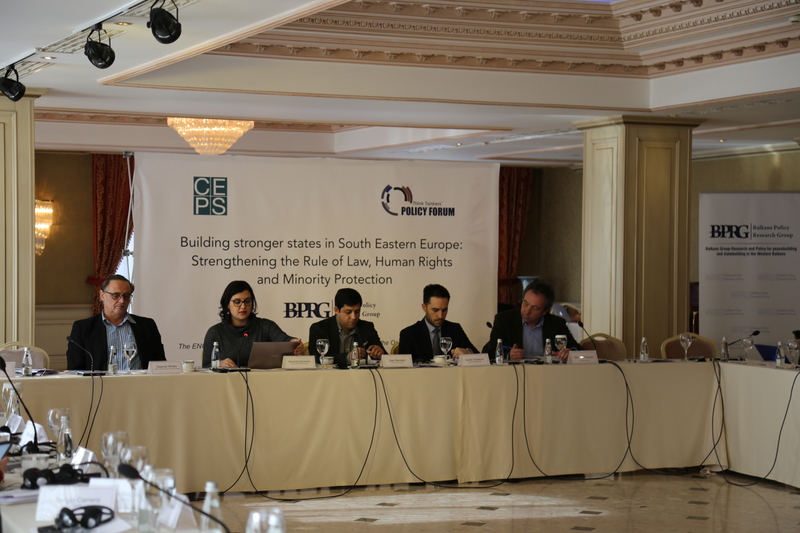 The Regional Cooperation Council (RCC)’s Roma Integration Policy Expert Danilo Smolovic participated as a panellist at the ENGAGE international event “Building stronger states in the Western Balkans and Eastern Europe: Strengthening the Rule of Law, Human rights and Minority Protection”, organized by the Balkans Policy Research Group (BPRG), in Prishtina on 7 February. Within the session on the role of the European Union in Roma inclusion and migration, organized with the goal of reflecting on the mid-term evaluation of the EU framework for National Roma Integration Strategies (NRIS), European Commission Communication on enlargement and relevant migration and asylum policies, role of the EU institutions, member states and candidates and their impact on building a coherent internal and external Roma inclusion strategy, Mr Smolovic underlined the need to support Roma in their places of origin to integrate and have a decent living. By ensuring so, Roma considerations to migrate would not by driven by necessity and the need to escape emergency living conditions. “Although we are, together with the governments of the Western Balkans and Turkey region, striving to increase effectiveness of the Roma integration policies, there are still Roma who leave or try to leave the enlargement region because of poverty and discrimination”, said Smolovic. Roma in the enlargement region are primarily in need of housing and employment opportunities. Those Roma who return from the EU are in need of additional support, such as civil registration of children born in the EU, recognizing their academic achievements, timely integration in the school system upon return, psycho-social counselling for those facing trauma etc. One of the basic preconditions for supporting Roma reintegration is stronger cooperation and exchange of information between sending and receiving territories. EU could appropriately support this process through co-funding of social integration policies and the capacity building of the authorities at the central and local level, which has been the case with IPA funding and projects such as the RCC’s Roma Integration. Furthermore, the region needs to effectively recognize widespread discrimination against Roma and tackle it vigorously, also through the affirmative action that is not comprehensively applied, and to further demonstrate the achievements in relation to Roma integration, by continuing monitoring practice of Roma integration, established within the RCC’s Roma Integration project. In the Phase II, the RCC’s Roma Integration project will continue to support Roma by seeking opportunities to formalize undeclared work, promote legalization of Roma settlements, and ensure Roma responsive budgeting of public policies. In addition to Roma inclusion and migration, a one-day conference, gathering relevant organizations dealing with rule of law, human rights and minority protection addressed the topics of effectiveness of the EU policies for strengthening the rule of law in the Western Balkans and rule of law erosion in Europe.